Bret Amundson will be a part of the event. St. Scholastica will host Minnesota Public Radio's Bring the Sing event from 10 a.m. to 1 p.m. Saturday, March 23, in the Mitchell Auditorium on campus. 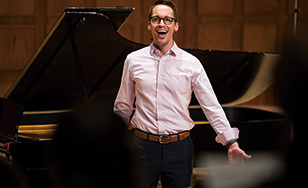 Described as "part choral workshop, part recording session," Bring the Sing has become a favorite local tradition for music fans. Participants are encouraged to register for the event beforehand at classicalmpr.org. Registered participants will receive their packet of sheet music by mail or by visiting the Duluth Whole Foods Co-op. Participants will work with St. Scholastica choir conductors Dr. Bret Amundson, dean of the School of Arts and Letters, and Dr. Sarah Ludwig, director of Choral Activities. Seating is on a first-come, first-served basis, and admission is free. All participants must sign a media release form. This will be the fourth year Bring the Sing has been hosted in Duluth by St. Scholastica, the institutional sponsor of Minnesota Public Radio in Duluth.